Located nearly 1,000km off the coast of Ecuador, the Galapagos Archipelago is almost a world within a world. On your Galapagos cruise, whether you are exploring the terrain of the many islands or off their shores, there is always a surprise of nature lurking around the corner. Pink flamingos adorn the shores of hidden lagoons. Prehistoric marine iguanas hiss and spit sprays of salt. Giant tortoises grunt in distant highlands. Flightless cormorants and tiny penguins dart amongst colorful schools of fish, while elegant tropical birds glide through deep blue skies. With such a varied and utterly unique flora and fauna it is difficult to do justice to the Galapagos experience with words alone. The only way to truly appreciate this “heaven on earth” is to see it for yourself on a Galapagos cruise aboard the Galapagos Journey. Aboard the spacious luxury yacht, Galapagos Journey, you will experience the Galapagos Islands at their best. Explore the hidden marine worlds of the Galapagos Islands and a wide range of ecosystems during your tour on the Galapagos Journey. Itineraries are built to ensure that you witness the diverse bird, reptile, and marine life as well as the natural exuberance of the Galapagos during your cruise. Itineraries provided here are sample itineraries and are subject to change depending on weather conditions or other unforeseeable events. 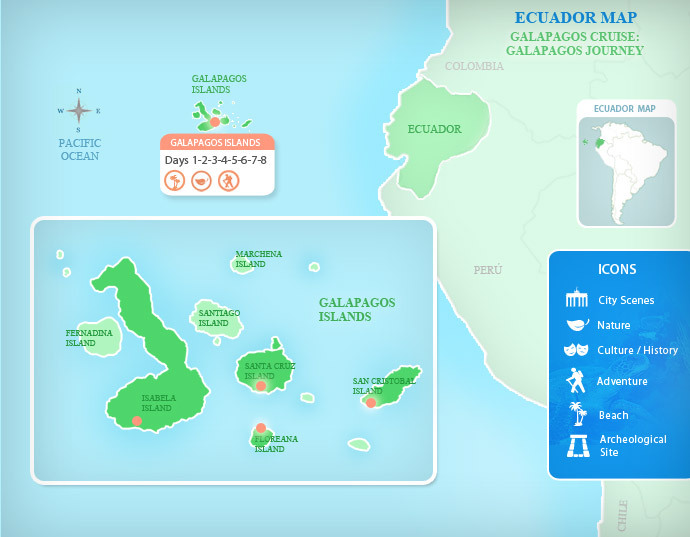 Day 1: In the morning, you’ll fly from Quito or Guayaquil (mainland Ecuador) to the Galapagos Islands. Upon arrival to the airport in Baltra, you will be transferred to the port for a short panga (motorized raft) ride to board your luxurious vessel, the Galapagos Seaman Journey. In the afternoon, you will enjoy your first Galapagos travel adventure with a visit to Los Gemelos (twin craters) before heading to the Santa Cruz Highlands. The highlands are the perfect place to catch your first glimpse of the wonderful wildlife that inhabits the archipelago. A variety of birds including the famous Darwin finch can be seen throughout your exploration of the highlands. Day 2: Start your first full day of cruising the Galapagos with a trip to Isabela Island. The marine life found in the waters surrounding the island includes white-tipped reef sharks, sea lions, and other sea creatures. The historic Wall of Tears is another of the island’s attractions. Isabela was originally a penal colony where prisoners were punished by having to build a wall with blocks of lava. You will be able to explore the island and climb a set the stairs to get a bird’s eye view of both the wall and Isabela Island. Day 3: After a hearty breakfast aboard the Galapagos Journey you will arrive at Punta Moreno where you will find a wide variety of birds that live amongst the many mangroves, lagoons and lakes. The afternoon will take you to Urbina Bay at the base of Alcedo Volcano. In the 1950s, a major uplift caused the land to rise by 16 feet, extending the coast by half a mile in distance and leaving much marine life standard. Urbina Bay is also great for snorkeling and for viewing one of the archipelago’s largest populations of land iguanas. Day 4: A full day of exploration awaits you on Fernandina and Isabela islands. First, you will head to Espinoza Point, famous for its colony of marine iguanas that swim off shore and bask in the sun. This island is also home to unique species such as the flightless cormorant, Galapagos pension, and Galapagos hawk. At Tagus Cove across from Fernandina Island, you will tour the beachside cliffs aboard a zodiac (look carefully for decades-old graffiti written by pirates, whalers, and buccaneers) and then hike 30 minutes along a trail that leads to the ultrasaline Darwin Lake. Day 5: Today you will travel to Santiago Island to visit Espumilla Beach. During the last El Niño phenomenon, one of the two lagoons became sedimented and the resident colony of flamingos departed. Today, the beach is home to nesting marine turtles and forests of palo santo, a tree with a white-grey bark that is burned as incense. Later in the day, you cruise ship will sail to the black sand beaches of Puerto Egas, which still hosts the abandoned infrastructure of a failed attempt by businessman Hector Egas to mine Galapagos salt. The bay’s shoreline is full of iguanas, sea lions, and it is possible you will see the rare Galapagos fur seal. You can also hike to the inland salt crater where a variety of bird species can be found. Day 6: Today, you will arrive at Rabida Island, with its distinctive red-colored beach. Rain and salt water have oxidized the volcanic rocks of the shore, which have a high iron content. A short trail leads to a coastal lagoon, home to finches, doves, yellow warblers, mockingbirds, and a colony of flamingos! The day concludes with a visit to a small islet known as Chinese Hat, named after the shape of the island when approached from the north side. The geologic history of the island is on brilliant display here, with features such as lava tubes, lava flows and coral heads that provide evidence of uplift. Galapagos penguins, marine iguanas, and colonies of sea lions dot the rocky landscape. Day 7: Start your day by visiting Sullivan Bay on the east coast of Santiago Island, where the main attraction is the opportunity to walk over un-eroded lava flows formed a little over 100 years ago. Insects and lava lizards hop around the sun-baked lava. Arrival to Bartolome Island in the afternoon will provide the perfect opportunity to explore the variety of volcanic landscapes found here. A short hike to 114 meters of elevation provides fantastic panoramic views over the island, including the iconic Toba pinnacle. Day 8: The last morning on your Galapagos cruise will detour to Bachas Beach, famous for its soft white sands made of decomposed coral. It is the favored nesting site of sea turtles. There is a second beach with a brackish water lagoon occasionally populated by flamingos, black-necked stilts, and whimbrels. Late in the morning, you will be taken back to Baltra and be transferred to the airport for your flight back to mainland Ecuador. Note: The 8-day itinerary aboard the Galapagos Seaman Journey is one of the many itineraries offered aboard this yacht. Ask your travel advisor for more details about other exciting Galapagos cruise itineraries. The Galapagos Seaman Journey is a luxury power catamaran offering high quality and comfortable Galapagos Islands cruises since 2008. The boat comprises 6 twin bed cabins and 2 suites equipped and decorated with the highest standards in mind. The M/C Galapagos Seaman Journey is a very spacious yacht with larger-than-average inside and outside social areas. The Catamaran has lots of open deck space allowing guests to make the most of the natural wonders of the Galapagos Islands. It also offers a wide range of activities such as snorkeling, sea kayaking and excursions with a multilingual naturalist guide.